Discounting isn’t new – but being able to put it into practice is something that, for many companies was just not practical until now. Dynamic Discounting allows suppliers and buyers to collaborate on payments in a way that wouldn’t have been possible 10 years ago and today, the economic conditions have created a perfect storm that makes dynamic discounting compelling. How does Dynamic Discounting Work? The supplier offers a discount for early payment. The earlier the payment, the greater the discount. Historically, it’s not always been easy to achieve arrangements that work for both supplier and buyer and because of practical problems, it hasn’t always been easy for buyers to actually pay early. But with the increased use of Purchase to Pay technologies and methods there is now no reason why a supplier cannot pay promptly – or late for that matter – depending on how the collaborative arrangements with the supplier have been agreed. So why is Dynamic discounting so compelling? Just consider what a 2% discount means for early payment in terms of return on capital. 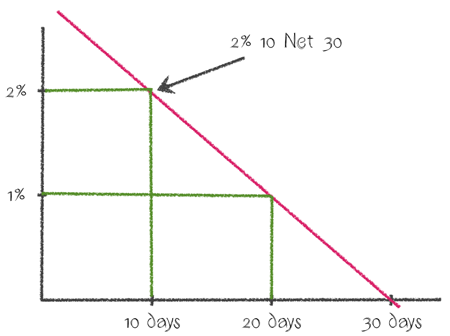 If, instead of earning interest on your cash you invest cash for 20 days to get a 2% return – that’s over 36% return on capital. Sure, you lose interest on that cash for 20 days! But how much? Even if you can get 5%, that is still just over a 0.25% that you lose far less than then the 2% you gain. That early payment may be inordinately valuable to your supplier who values cash flow more than high margins. And this is the point. For many suppliers credit is either difficult to secure or expensive. By working closely with customers and leveraging the power and flexibility of a P2P system, they can create a genuine synergy that reduces prices, reduces the cost of borrowing and ultimately – reduces the cost of doing business. Your P2P or procurement software vendor will show you how to get Dynamic Discounting up and running or you could research these vendors: Taulia; Ariba; The Receivables Exchange. How do you calculate the value of dynamic discounting? Dynamic Discounting – Opportunity or Financial Fantasy? Very concise article but also self explanatory video. I would just take this opportunity to add that should the buyer be not willing to use its working capital to settle early part of all supplier invoices, a bank can be tasked to run payment for a portion of the supplier portfolio. -when cash rich having the choice to pick & mix between direct payment (attractive discounts) and bank settlement (commission). Organizations receiving discounts from suppliers for early payment is nothing new. For decades, Accounts Payables (A/P) departments have been making use of early settlement discounts.. Dynamic Discounting is rapidly gaining acceptance among AP departments at large corporate organizations because it can save buyers up to 0.5% of their annual spend. Taulia’s Dynamic Discount Optimizer maximizes your AP department’s revenue generating potential by offering your suppliers early payments and dynamic payment terms.